Explore Fermilab science from a kid's point of view. Designed for middle school field trips, the hands-on exhibits at the Lederman Science Center are available to the general public. 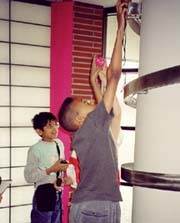 Exhibits are most appropriate for children ages 10 and older. You can buy Fermilab logo items at the store. Educators who have attended workshops may bring their students here for field trips. Location: Located at Fermilab about 35 miles west of Chicago, the Center is easily accessible from the Fermilab main entrance at Kirk Road and Pine Street in Batavia, just three miles north of the I-88/Farnsworth Avenue tollway interchange. See the Map. Hours: The Center is open to the public MondayFriday 8:30 AM4:30 PM and on Saturdays from 9:00 AM3:00 PM. On holidays, call to check if the Center is open. Arrangements: The Center can accommodate groups of five or fewer on a walk-in basis. Larger groups must book a visit. Call 630-840-8258 for more information. A guided tour for families is available the first Saturday of the month from 10:00 am to noon. Before you come: Watch videos of what you will see when you come to the center. Read the visitor's handout.